So the news is that the IRA used the luxury British ocean liner, the QE2, to smuggle weapons in the '70s to use against the Brits and their sympathizers holding Ireland hostage. For experts on history (and all other matters), like your beloved Wolfie, the ironies are irresistible. The QE2 was owned by the Cunard Line, which, coincidentally, also owned the luxury passenger ship RMS Lusitania many years earlier. 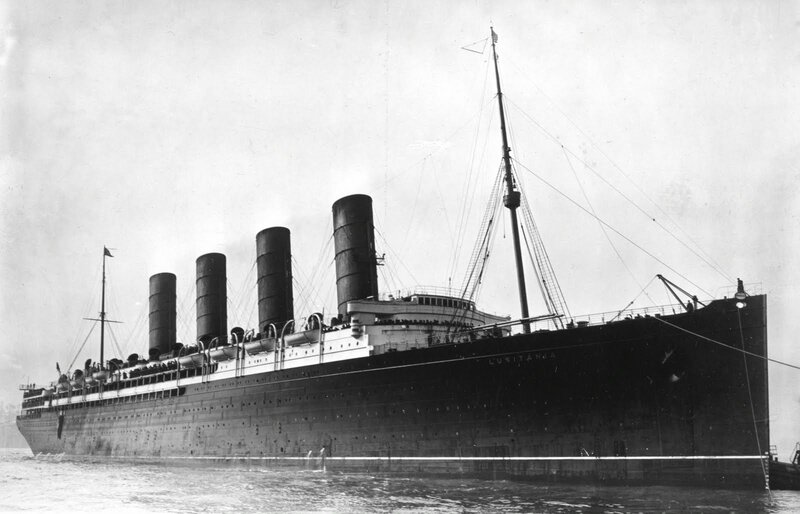 Although ocean liner and history buffs still fight over the details and just about everything else, everybody now knows that the Lusitania was also in the business of transporting arms -- though in this case, the arms were "smuggled" by the Brits for the Brits in World War I. It was all supposed to be top-secret, but as is often the case with "British Intelligence," a lot of people had a pretty good idea what was in the cargo hold next to their steamer trunks. In fact, the German Embassy took out ads in 50 American newspapers warning passengers they were risking their lives by traveling the high seas on a ship flying the British flag. After all, the two nations were already at war. Ironically, the New York Times ad appeared right below an ad for the Lusitiania herself. The Lucy's last voyage from New York in May 1915 was going splendidly until Ireland was literally in sight, though the luck of the Irish was nowhere to be found. It was there, just eight miles off the Old Head of Kinsale, that a clunky German submarine (U-boat) -- with just one torpedo left -- surfaced. With its stinky lawnmower-like engines, the sub had been barely able to keep up with the speedy Lusitania until this critical moment, but caught a clear line of fire when the giant ship changed course and turned toward her destination. The sub fired its last-chance torpedo, which hit the Lucy below the water line with a mighty blast. Then, a second and even-stronger explosion rocked the ship -- almost certainly the explosion of it "special cargo." Mortally wounded and flooding fast, the Lucy heeled over and sank in less than 20 minutes (much faster than the Titanic, in case you were wondering). Of the 1,959 souls aboard, 1,198 were killed. Crucially, more than a hundred were Americans, some of them prominent personalities. The sinking of the great British liner provoked outrage around the world on an unprecedented scale. U.S. President Woodrow Wilson's resolve to stay out of the war began to melt, and America signed up in April 1917. "Remember the Lusitania! Avenge the Lusitania!" inspired many young Americans to volunteer for service. But... Was the sinking of the Lusitania planned by then-Lord of the Admiralty Winston Churchill to bring the United States into the war? It's the stuff of some of the best conspiracy theories ever concocted, and if you think I'm going to give you my (actual) opinion, you're nuts. You think I want my doghouse torpedoed?